I’m going to be a terrible blogger today. I’ve got no story to go with my cookies, viagra 40mg and even if I did, salve I have no time to write it! But, I figure a recipe, description and a picture is better than nothing. These are impulse cookies. It was Sunday night and I just really wanted something warm and chocolatey from the oven, so I used whatever I had on hand. Chocolate and espresso make a perfect cookie in my book. Add some pecans and I’m a happy camper. Make these cookies and you too will be a happy camper! In a medium bowl whisk together the whole wheat pastry flour, espresso powder, baking powder, salt, and cacao powder. Set aside. Cream the butter and sugar in your electric mixer with the paddle attachment (or use a hand mixer, or whisk vigorously by hand). Add the egg, then scrape the sides down and add the vanilla. Mix until incorporated. Carefully, add the dry ingredients to the wet ones, stirring until you get a nice, brown dough. Stir in the pecans until evenly distributed throughout the dough. Use a tablespoon to measure out little dough balls onto the prepared cookie sheet. Bake for 10 minutes in the center oven. Make sure you don’t over-bake them or they’ll lose their fudgy interior texture. You hit all the spots with these! No need for a story. The pictures say it all. Those sound amazing and healthy too! I love spur of the moment cookies and I just found this blog: love it! These look lovely. I love the mocha with the pecans. I have got to try them!! These look wonderful. I am a sucker for anything with pecans! I made these yummy cookies this weekend!! Even for a someone, who has never baked anything from scratch before, they were really easy. 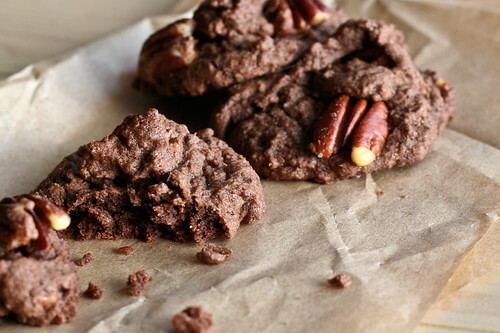 Definitely will be making these again and might even try substituting the pecans for chocolate chips.